With 50 years of experience Haughey Antiques has a wealth of knowledge and reputation for excellence and quality. 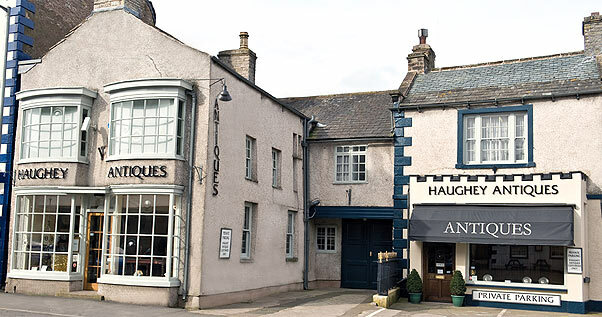 The leading antique dealer in Cumbria and the North West, Haughey Antiques is renowned for sourcing all manner and era of quality antique items, including furniture, antique clocks, dining tables and chairs, company boardroom furniture and rare collectors’ items. Melvin Haughey, a traditional antiques dealer, selects each piece of stock for quality, originality, good proportion, fine colour and patina.Melvin Haughey established his Cumbria antiques business in 1969. Following on his family tradition he rented a small shop and warehouse in the ancient Cumbria market town of Kirkby Stephen. Moving in 1980 to the present premises, formerly the 17th century Red Lion Inn.Large open galleries stock fine pieces including: Early 17th century English oak, Queen Anne period walnut, Georgian mahogany and Regency formal furniture, including items attributed to Gillows of Lancaster. We also offer a meticulous restoration service to repair and rejuvenate your antique furniture and treasured items and have extensive expertise in antique valuation. We offer one of the most experienced and trustworthy services in Cumbria and the North West and can provide invaluable advice on investment in antiques and fine art. 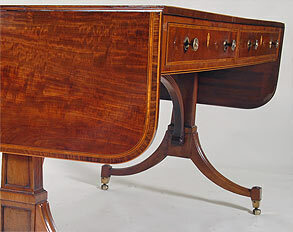 In 1991 Haughey Antiques exhibited at the inaugural LAPADA Show at the Royal College of Art, London, which established its reputation as dealers of ‘London discerning quality and eclectic variety’. Haughey Antiques regularly exhibit at London Olympia.Haughey Antiques were proud and honoured to be awarded the Best General Antiques Dealer (North of England) Award in 2003. The British Antiques and Collectibles Awards were presented annually for five years by T.V. Presenter and Chairman of BACA Eric Knowles, on behalf of Millers Guides to recognise excellence within the antiques industry. Judging was based on: Quality of service, consistent quality of stock and depth of knowledge. Kirkby Stephen is a small market town in the Upper Eden Valley, in the old county of Westmorland, which is now Cumbria.The town is located on the A685 (12 miles east M6 Jnc 38) surrounded by sparsely populated hill country and about 25 miles from the two nearest towns of Kendal and Penrith. The River Eden rises 6 miles away in the Mallerstang Valley and passes by the eastern edge of the town.A traditional market town of historic buildings including the parish church of St Stephen, known as the ‘Cathedral of the Dales’. Kirkby Stephen was granted a charter from King Edward III in 1361 for a market and two yearly fairs to be held in the town. This was reaffirmed in 1606 to George Earl of Cumberland by King James I.
Kirkby Stephen serves as a base for tourism in the Eden Valley, especially for walking being on the line of Alfred Wainwright’s ‘Coast to Coast’ walk. The railway station on the scenic Settle-Carlisle line is a mile to the S.W. of the town.